that is exactly what we have done. Here is the wall before. We had a wall seperating the kitchen and the living room. We wanted it out. It made the house feel so much smaller. I know the pictures were real crooked, but I was about to take them down anyway. It seemed like a daily chore straightening them. So we enlisted some trusty to friends who had some anger issues and they kicked holes in our wall and punched the wall. Sorry I did not take pictures of the blood!! Yes I am serious, blood. Boys will be boys. Rainy wanted to apart of all this action too. What a good dog! So Worth and I worked on cleaning up the mess that the boys made. Worth took off the sheet rock and I vaccummed (how do you spell that word again Katie?). Worth's dad came the next day and helped to take out the studs. We are getting there, but when you come to visit please pardon the mess. It has to look bad before it gets better right? We picked out our hardwood floors. They are beautiful. I can't wait for them to go in, but first we move the washer and dryer to the garage. That is Worth's project today, and then we must paint, and then the floors!!! Yeah! I will continue to update you on our progress. We have three months and counting before Bella Rose will grace us with her presence. We will be in overdrive getting it all done. Okay so that last picture was terrible and I can't figure out how to delete it. This is a better one that Worth took. I think that you can see the belly better. As you can see he added some decoration behind me, his new lever action 22 rifle. He got it for his birthday, but not from me. I got him skateboards. 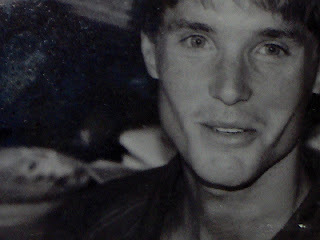 Did I mention that he turned 32? Just checking. 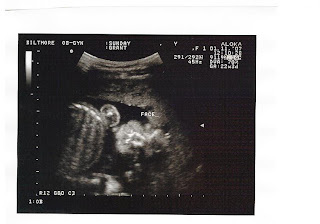 Well this picture is still me at 24 weeks, just a little later in the day :). We did some nursery work this weekend. I hate that Worth has to do most of the work b/c he knows what he is do and I do not. I know that I can paint so that was my mission for the weekend. I painted and it wore me out. Who knew that growing a baby could be so tiresome. Now you have to have a vision when you look at the nursery. It is going to have a white chair rail seperating the pink from the brown, and Worth is going to put arts and crafts trim up around the doors and the windows. All the furniture will be white, and that is at the level of the brown, so essential the brown is an accent color. Do you see it? Also that green light will not be there. These pictures are the after and before. Not in the proper order, but figuring out pictures on this thing is really hard (i just previews this page and the pictures did come out before and after, but not how i had them arranged. i just don't get this thing). As you can see the deer heads are gone!!!! Score one for Sunday and Bella Rose. This is me today, 24 weeks. I am in my last week of my 6th month, or on the last week of my 2nd trimester. In one of my books she is considered "viable" now if she were born. How scary is that. There is so much more to do here. I hope that she likes her home for right now b/c we are not ready. I will have house pictures to show you soon of the progress and the mayhem. Also sorry the picture is not so good, I have not figured out how to take tummy pictures yet. I know that we have already seen this image, but i want you to look really close. 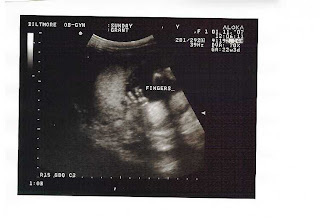 you see little Bella Rose's hand right? do you see below her hand and a little to the right? it looks like two fingers. they are really looking like worth's fingers. it took me awhile to see it as well. you have to look closely at it. worth picked this out as soon as he got the picture. it looks like a hand is holding Bella Rose. the hand of God? we would like to think so. So prayer was answered for us and we could not be more joyful. 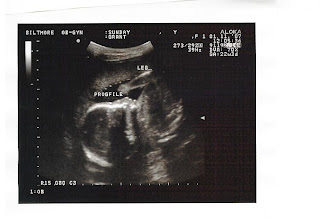 My placenta has moved and our sweet Bella Rose has 4 chambers in her heart. Her heart beat is 177 b/c she was moving around so much, but she still managed to stay pretty curled up. We love the picture of her hand. Isn't that just so sweet. All other parts of the doctors appointment went really well. I have to do the sugar thing next month and we are going to sign up for a birth class for when I am into 30 weeks, so things are moving along quite nicely. Thank you all so much for loving us and Bella Rose and praying for us and with us. We love you! So I know it has been awhile and I needed to share my final bits of Christmas Joy. I cannot believe how fast everything happened. Our poor tree now sits in the front yeard waiting for a final resting place, which by the way will NOT be in a landfill. I just wanted to show one last picture of our tree in all its glory. I loved this one so much. It was a favorite for sure. Once the presents were gone though I noticed that it was always leaning to the left. I guess it gave it some personality right? Rainy wants to say Merry Christmas and a Happy New year to you as well. She had a good one although there were no milkbones for her under the tree, that could be why she has a sad face. This is where the nursery is going to be. As you can see it is in no condition for a tiny little girl to go in. As much as Worth thinks that the deer heads belong, they just don't. I have visions and plans for this room though. We are in the process of doing some cleaning and throwing out. We only have 4 more months. Can you believe it!!! Worth just took out his drum set yesterday. I told him he did not have to do that, but he did anyway. It was pretty sad watching him put them away. I guess we are really growing up! This is my dreams sort of for the nursery. That is the bedding, and my sister gave us a gorgeous Italian bed that is antiqued looking that I think this will go wonderful with. 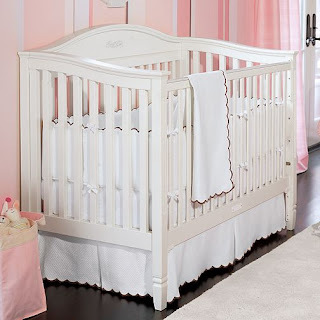 Worth is going to build us a changing table that is white and I hope to have a white chair in there, but many people are saying a white chair is NOT the way to go. We will see if I listen. As I mentioned before the bottom half of the room will be chocolate brown. A chair rail will seperate the 2 colors and the top half will be "Tea Rose" which is like a real light baby pink. I know the chocolate seems a bit dark, but sun shines in the room all day and with all the white I think it will look fabulous!!! So what do you think ; ). PS- jessica i will work on a belly shot for you. There is starting to be a little bump there. It is pretty wild.